The Washington, D.C. area has one of the highest median incomes in the country — and some of its most expensive housing. But amid all the market-rate homes and luxury apartments, the city is making room for affordable housing through a mandatory, district-wide inclusionary zoning program. 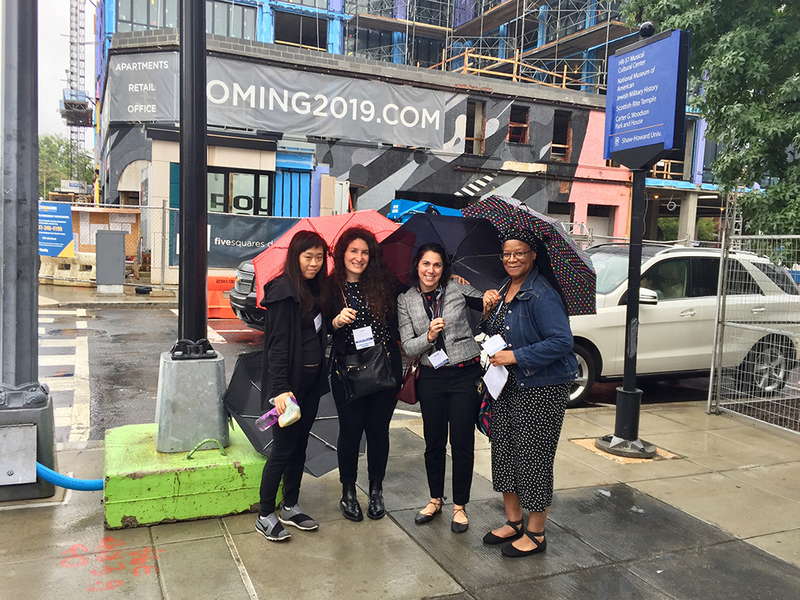 A group of planners braved the rain during APA’s 2018 Policy and Advocacy Conference to see the program at work. Umbrellas and ponchos on hand, attendees splashed along the 14th Street NW corridor, one of D.C.’s most productive areas for inclusionary zoning. Tour guides Art Rodgers, the senior housing planner for the D.C. Office of Planning, and Gene Bulmash, the inclusionary zoning program manager with the Department of Housing and Community Development, pointed out new and historical mixed-income buildings along the way. Amy Liu, AICP, Dara Osher, Amanda J. Chiancola, AICP, and Janelle Myers pose in front of a mixed-use, mixed-income development currently under construction. Photo by Lindsay Nieman. It’s a unique opportunity for inclusionary zoning, explained Rodgers, who introduced the program to the district’s zoning regulations ahead of its implementation in 2009. High land costs, expensive market-rate apartments, historical character, vibrant arts and retail, and infill development are all at play here, making it a complicated — but successful — case study. The corridor alone houses more than 300 of the city’s affordable units. 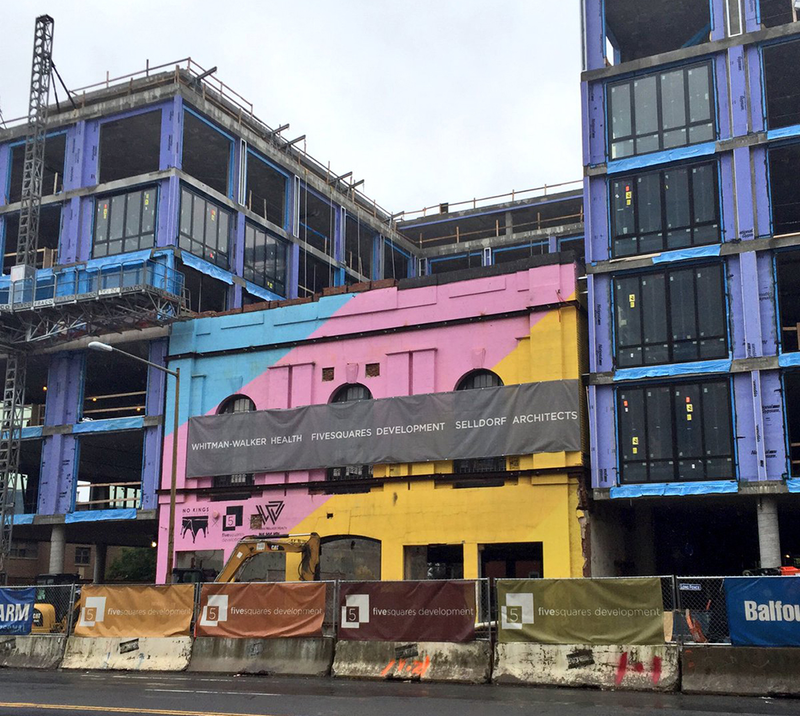 Washington, D.C.’s 14th Street NW corridor is a thriving epicenter of arts, retail, and inclusionary zoning. Photo by Lindsay Nieman. Attendees looking for evidence of inclusionary zoning from the street level failed to find any — the program requires that market-rate and affordable units be identical from the exterior. It also requires residential developers to dedicate up to 10 percent of their projects to lower income households for the life of the building. Units are targeted at 60 percent of the median family income (MFI) for rental and 80 percent MFI for ownership units. Market-rate rents average about $3.68 a square foot along the corridor, while affordable units range from $1.60 to $2.40 per square foot. In return for compliance, the program gives developers a 20 percent bonus density and building envelope flexibility. All new residential developments along the 14th Street NW corridor are required to dedicate a portion of units to affordable housing through D.C.’s inclusionary zoning program. Photo by Lindsay Nieman. 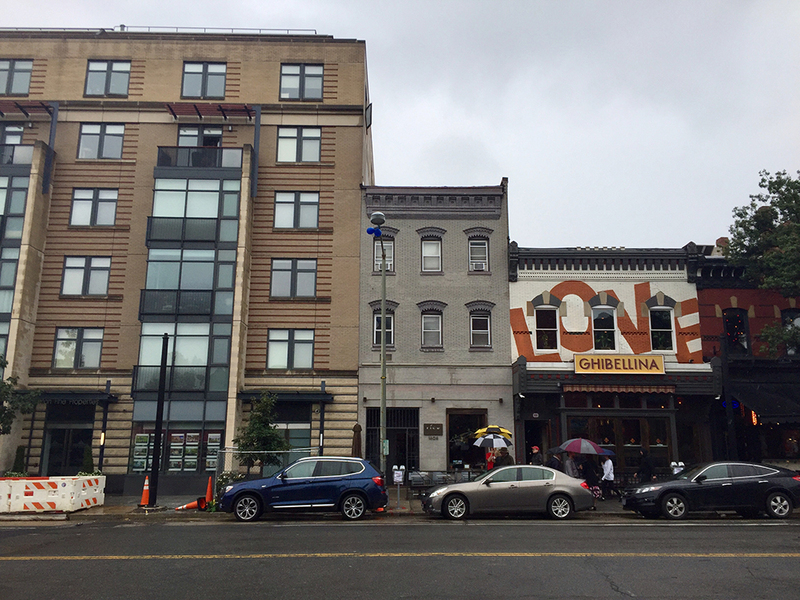 Inclusionary zoning’s success isn’t limited to the 14th Street NW corridor. According to the FY 2017 report, nearly 200 new units were added through inclusionary zoning in 2016 and 2017 each, and in a variety of neighborhoods — even those with million-dollar homes. It’s all part of a broader effort from the city’s planning department to promote better housing affordability during a period of high growth. Top image: A construction project in Washington, D.C. Photo by Flickr user outtacontext. Lindsay Nieman is associate editor of Planning magazine.